Julia Dennis studies Marketing and Interactive Media at Northeastern University, but she’s not your typical college student. She doesn’t just study abroad, she works abroad. Her program lets her take time off to dive into a career, and she’s chosen to spend that time in foreign countries. Because, why not? After interning in Seville, Spain for 6 months, she’s currently working in Bratislava, Slovakia. Alongside some freelance graphic design, she loves to write about her travels on her website and is always planning her next adventure, whether it be her next 6-month foreign internship, her gal-pal getaway to Greece this spring, or an upcoming weekend rendezvous to Berlin. AtwBeauty: Tell us about your favorite place in the world! 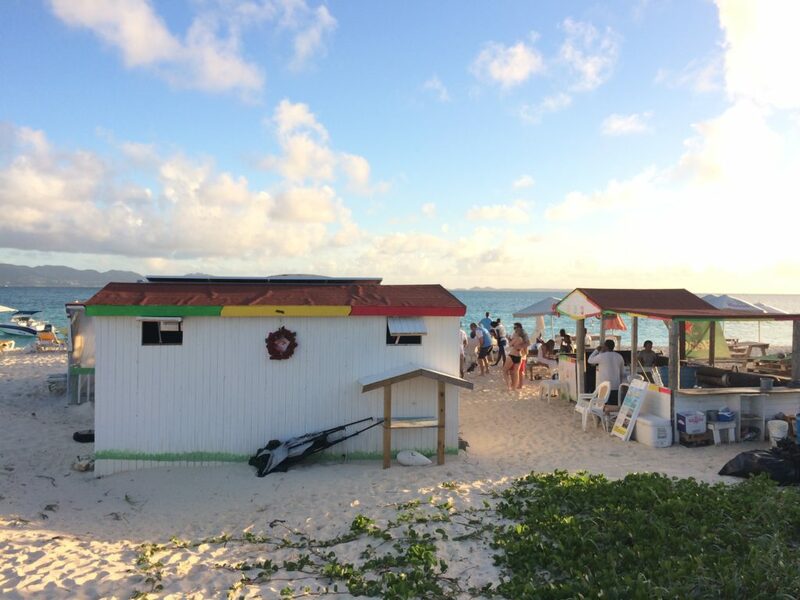 Julia Dennis: My favorite place in the world isn’t a country or even a city—it’s a teeny little bar & grill in Rendezvous Bay, Anguilla called the Sunshine Shack. (Say that 5 times fast) I have some of my fondest memories here simply sitting back with my family, humming along to the happy reggae music that’s playing, and taking in the views of the pristine waters and glimmering yachts. The islanders who own this bar treat you like you’re family and always offer some simple but profound life advice with a smile. They’ll take you out on their banana boat and tell you to “look out for the Rasta shark”, whip you up a refreshing piña colada, and provide you with a comfy chair to kick back on. An added benefit of this fantastic location is that Anguilla is full of my favorite animals running around—baby goats! I only spend a few hours a year here, but they never fail to be some of my favorite. Julia Dennis: My travel beauty routine is pretty much a simplified version of my normal day-to-day routine (because a girl can only fit so much in a Ryanair-worthy carry on). The most important thing for me is to moisturize IMMEDIATELY after I get out of the shower to keep my face from feeling super dry—so I always make sure to pack a little bit of face cream with me. I also love curling my hair when I go out, so I always make sure to sneak in my curling wand into my bag before I go on a trip! I have this pink Remington curling wand that was like $25 on Amazon but I swear by it and I’ve got my friends hooked on it too. ATWBeauty: 3 Beauty products you can’t travel without? Julia Dennis: My absolute #1 product I can’t travel without is definitely chapstick (Burt’s Bees is my favorite and a total classic! )—I seriously need it within a 10 foot radius of me at all times. Besides that, I always make sure to carry sunscreen with me if I know that I’ll be catching some rays at all. I hate sunburn more than anything and want to keep my skin looking youthful and wrinkle-free! Lastly, I love a trusty bold lipstick for when I’m having a fun night out in a foreign city. It’s a way to really amplify my look without having to pack a billion different beauty products. I’ve been recently addicted to NARS’s Velvet Matte lip pencils because they stay in place all night and aren’t super drying. 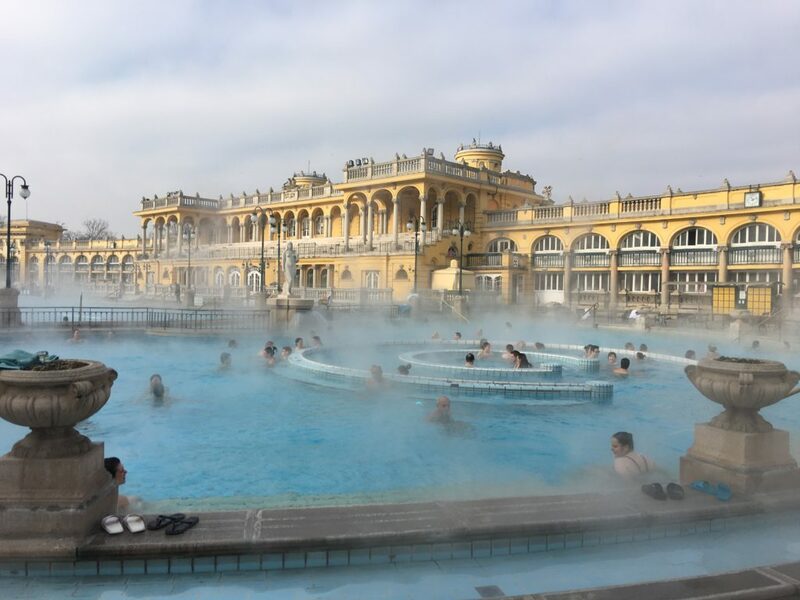 Julia Dennis: During my recent trip to Budapest, I visited the historic Szechenyi Baths for some serious R&R and to see what the Hungarian bath culture was all about. It’s the largest medicinal bath in Europe, and its water is supplied by two natural thermal springs. It was about 25 ºF outside the day I went, so dipping into the warm water was an instant “ahhh” moment that seriously relaxed my muscles that were tired and sore from walking around all day. I walked out of this beautiful baroque bath feeling like I was walking on a cloud! Follow Julia on Instagram and her own travel blog to keep up with her travels, and reach out to us to be the next featured #BeautyTraveler! The Budapest Szechenyi Baths – popular even in the cold weather!